The stage was set in World War I for the Battle of Belleau Wood by General Ludendorff when he launched his Chemin des Dames offensive against the Allied Northern Front on May 27, 1918. The Fourth Brigade, American Expetionary Forces, with other Allied units, was ordered to move up from training areas. On the morning of May 30, Marines climbed into trucks and headed north. The caravan took a road that skirted Paris. The Americans were placed astride the stratigic Paris-Metz highway. Fragments of the Allied armies began retreating along the highway, and a senior French officer advised the Marines to join them. A Marine officer replied: "Retreat hell! We just got here." To the left of the Marines was Bois de Belleau, three square miles of rocks, wood, and 1,200 elite soldiers from the 461st Imperial German Infantry. On June 4 and 5, Marines held their positions along the highway. On June 6, the Fifth Marines counterattacked against the woods and Hill 142. By day's end, the edge of Belleau Wood and Hill 142 were taken at the expense of over 1,000 casualties. For four days, Marines hammered their way through the woods. On the 13th, the Germans counterattacked. The entrenched Marines started to drop the enemy at 400 yards with concentrated rifle fire. After the attack waned, the lines did not change until the 24th, when Marines began mopping up the area. On June 26, they proudly announced, "The woods are now the United States Marine Corps' entirely." At the end of the battle, the Marine brigade had suffered 55 percent casualties, 1,062 killed and 3,615 wounded. What was gained was not just a small battered woodland. The action stopped the last major offensive of the war by the Germans. In doing so, it drew the Corps the respect and admiration of our allies and our country. The 4th brigade was awarded the French Citation, L'Orde de L'Armee, and the wood was officially renamed Bois de la Brigade Marine. German soldiers later referred to the US. Marines, respectfully, as "Teufelhunde" or "Devil Dogs," because of their fierceness in battle. 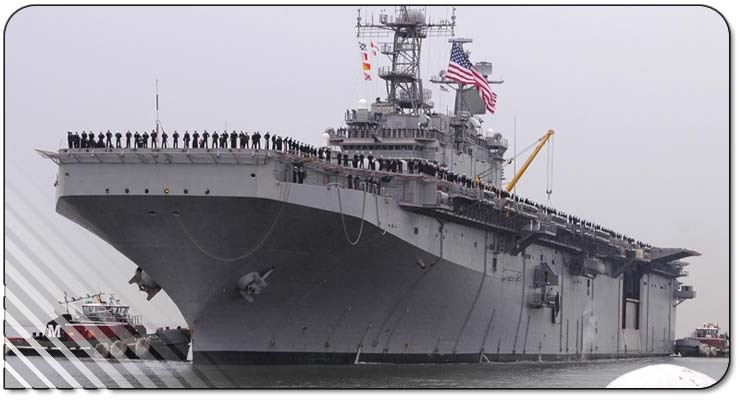 USS BELLEAU WOOD was commissioned on September 23, 1978 in Pascagoula, Mississippi. Homeported in San Diego in October 1978, BELLEAU WOOD participated in her first full-scale operation in 1979 off the coast of Hawaii. BELLEAU WOOD began her first major deployment in January 1981. The ship rescued 150 Vietnamese refugees, earning the crew the Humanitarian Service Medal. The deployment included three major exercises and eight port visits. In August 1982, the ship began its second deployment and participated in four major amphibious exercises. 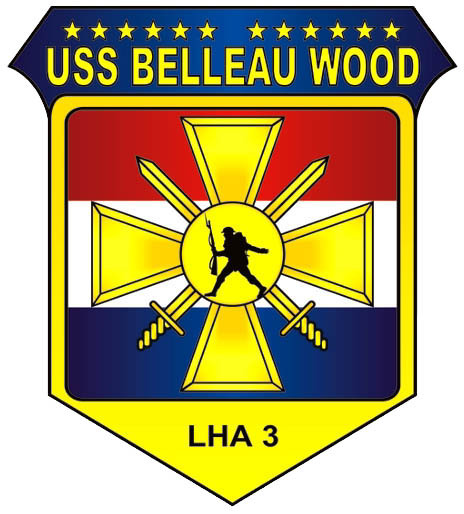 BELLEAU WOOD's third successful SEVENTH Fleet deployment ran from January to July 1984. The ship then completed an 11-month complex overhaul at Puget Sound Naval Shipyard, Bremerton, Washington. In January 1987, BELLEAU WOOD began a deployment which included the first winter amphibious exercises off Alaska since WWII, and introduced the ship to the AV-8B Harrier jump jet. The ship also received the Admiral Flatley Memorial Award for Aviation Safety. On October 4, 1989, the ship hosted the Minister of Defense of the Soviet Union, during his historic visit to the United States. BELLEAU WOOD entered her second complex overhaul in Long Beach California in 1990. Major work included an upgrade to CIWS and installation of the Rolling Airframe Missile System. In July 2000, BELLEAU WOOD took part in the largest crew swap to date when she was relieved as forward deployed amphibious assault ship. The procedure started when USS ESSEX (LHD 2) arrived in Sasebo on July 13, 2000. The swap was part of a planned rotation of forward deployed naval forces in Japan, and was the third crew-swap exchange. The ships’ crews simply switched ships, minimizing the impact of moving families from homeport to homeport. Sailors in Sasebo assigned to USS BELLEAU WOOD, moved on to ESSEX, while Sailors from San Diego assigned to ESSEX moved aboard BELLEAU WOOD. BELLEAU WOOD and the San Diego-based crew then returned to San Diego in mid-August to begin overhaul and maintenance cycles. BELLEAU WOOD was forward deployed to Sasebo since the fall of 1992. Description of Coat of Arms: The official seal of BELLEAU WOOD is a blend of symbols. An image of a fighting U.S. Marine is at the center of the plaque. The leatherneck is in World War I battle dress. He carries a rifle with bayonet, and seems to beckon us to follow him. Surrounding the figure are the gold cross, shield and swords of the Croix de Guerre, the French medal awarded to the Marines who distinguished themselves at Belleau Wood. In that tradition, Marines of the Fourth Brigade are permitted to wear the French fourragere to this day. Twelve gold battle stars in a field of blue line the top of this plaque. They stand for the World War II record of our ship's namesake, USS BELLEAU WOOD (CVL 24). The gap between the sixth and seventh stars represents the ship's only break in her war record. On 30 October 1944, while off Leyte Gulf, BELLEAU WOOD was struck by a kamikaze airplane. The ship then had to undergo repairs and an overhaul, hence the gap. Blue and gold, prevailing hues of the plaque, are traditional colors of the Navy. The tricolor (red over white over blue) reminds us that the Battle of Belleau Wood occurred in France, and that Marines who gave their lives at Belleau Wood did so in the defense of another nation's freedom. The segments also bring to mind our own nation's colors.